This adorable 3 bedroom 2 bath cottage at Carolina Beach will not disappoint! As soon as you walk in the door, it's like being transported back in time when life was simpler. 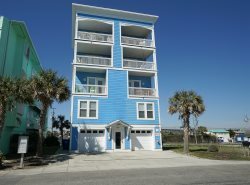 Yes Dear is an oceanfront home located about 1.5 miles to the Carolina Beach boardwalk on the north end of Carolina Beach, about 3 blocks from the Carolina Beach Fishing Pier. There are also numerous restaurants nearby! The kitchen is well stocked with everything you need during your beach vacation. The master bedroom has a king sized bed and a private bath. The second bedroom has a queen, while the third bedroom has two twins. There is a guest bathroom that is accessible through the hallway by the two guest bedrooms. The dining table has seating for six. There are no washer or dryer here but there is a laundromat on the Island if doing laundry is a must.